Isaac Renner was born in 1772 at Frederck Co, VA.. He was the son of George Renner and Barbary Pitcock. He died in May 1826 at Frederck Co, VA..
Capt. John Flowers married Sarah Barkley in 1800. [S3499] Alice Jo Hess, History of Medicine in Harrison County, WV., pp. 349-353. Sarah Barkley married Capt. John Flowers in 1800. Nathan Wright was born on 8 February 1833 at Harrison Co, WV.. He married Gelina J. Cunningham, daughter of Christopher C. Cunningham and Elizabeth Linville, on 14 March 1878 at Harrison Co, WV.. He died on 20 November 1916 at Harrison Co, WV., at age 83. [S2103] 1900 Harrison Co, WV. Census, Clay District. Frederick M. Ashcraft was born on 13 July 1864 at WV. He married Rebecca M. Cunningham, daughter of Christopher C. Cunningham and Elizabeth Linville, on 29 September 1889 at Harrison Co, WV.. He was a coal miner. He died on 5 May 1934 at Wyatt, Harrison Co, WV., at age 69. [S1315] 1910 Harrison Co, WV. Census, Eagle District. [S1353] 1930 Harrison Co, WV. Census, Eagle District. [S2103] 1900 Harrison Co, WV. Census, Eagle District. 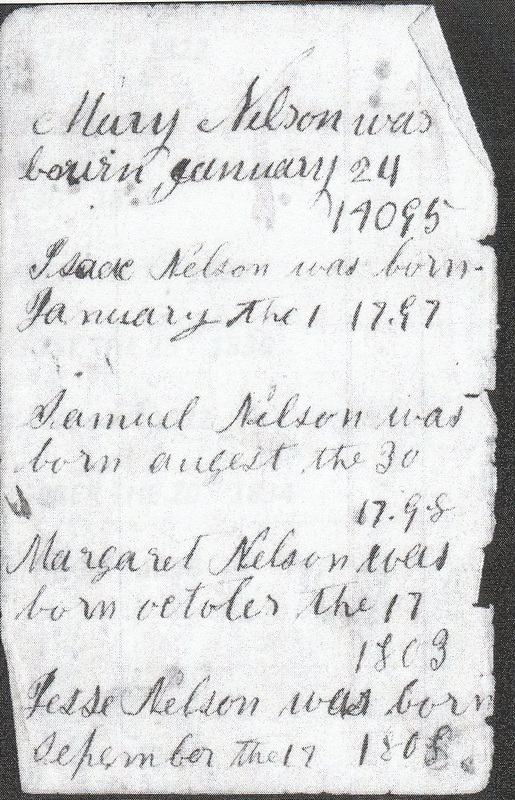 Mathias Nelson was born in 1770 at VA. He married Catherine Renner, daughter of George Renner and Barbary Pitcock, on 20 December 1793 at Frederick Co, VA.. He migrated about 1817-1818 from Fredrick Co, VA. to Whiteley Twp, Greene Co, PA. He was last taxed in Frederick Co. in 1816, and was first taxed in Greene Co. in 1819. He died in 1829 at Greene Co, PA..
[S2372] Connie Anderson, e-mail to Howard Hickman, March 2008. Nicholas Hickman was also known as Johann Nikolaus Heckman. He was born on 16 April 1723 at Rothenberg, Germany. He married Elizabeth (---) on 14 January 1749 at Rothenburg, Germany. He immigrated on Ship Brothers in 1752. He appeared in the church records of Williams Twp, Northampton Co, PA. He migrated to South Fayette Twp, Allegheny Co, PA. in 1773. He died in 1802 at Allegheny Co, PA..
[S2107] Hoyt Hickman, e-mail to Howard Hickman, 2000 and 2006. [S4649] Mary Morledge Brownlee, History of Peter Hickman. Elizabeth (---) married Nicholas Hickman on 14 January 1749 at Rothenburg, Germany. Adam Hickman was born in 1754. He was the son of Nicholas Hickman and Elizabeth (---). He migrated with his father to South Fayette Twp, Allegheny Co, PA. in 1773. He obtained a patent from Virginia on land in Allegheny Co in 1776. He married Mary "Polly" Stillwell. He settled in 1802 at Columbiana Co, OH.. He died in 1824 at Yellow Creek Twp, Columbiana Co, OH..
[S2110] 1820 Columbiana Co, OH. Census, Yellow Creek Twp. [S2111] Estate Record Columbiana Co, OH. ,p. 449. [S2123] 1790 Allegheny Co, PA. Census. [S2131] 1784 Cecil Twp, Washington Co, PA. tax. [S1699] 1781 Washington Co, PA. Tax ,Cecil Twp. [S1913] 1798 PA Direct Tax List ,Fayette Twp, Allegheny Co, 115 acres. [S3918] PA Septennial Census ,Washignton Co, 1786. Elizabeth Hickman married (---) White. She married (---) Cochran. She was born circa 1757. She was the daughter of Nicholas Hickman and Elizabeth (---). Peter Hickman was born in 1758 at Germany. He was the son of Nicholas Hickman and Elizabeth (---). He migrated with his father to South Fayette Twp, Allegheny Co, PA. in 1773. He served in the militia from 1781 to 1783 at Washington Co, PA.. He married Abigail Fawcett on 5 January 1796. He died on 25 September 1825 at Allegheny Co, PA..
[S2108] Beers, Biographical Record Washington Co, PA., p. 1286. [S2109] 1810 Washington Co, PA. Census, Fayette Twp. [S2116] Allegheny Co, PA. Record of Deed ,Vol. 46, p.15, dated 6 Sep 1833. [S2133] Washington Co, PA. Tax List ,1822 to 1824 Cecil Twp. [S2167] 1820 Allegheny Co, PA., Fayette Twp. [S1913] 1798 PA Direct Tax List ,Fayette Twp, Allegheny Co, 100 acres. Abigail Fawcett was born circa 1776. She married Peter Hickman, son of Nicholas Hickman and Elizabeth (---), on 5 January 1796. She died on 27 January 1842 at Allegheny Co, PA..
Benjamin Hickman was born on 8 June 1801 at South Fayette Twp, Allegheny Co, PA; alternate birth date: 14 Mar 1801. He was the son of Peter Hickman and Abigail Fawcett. He settled on a farm at Cecil Twp, Washington Co, PA.. He married Nancy Jordan on 8 March 1832. He died on 20 April 1881 at Cecil Twp, Washington Co, PA., at age 79. [S2127] 1840 Washington Co, PA. Census, Cecil Twp. [S2130] 1850 Washington Co, PA. Census, Cecil Twp. [S3102] 1860 Washinton Co, PA. Census, Cecil Twp. [S1805] 1870 Washington Co, PA. Census, Cecil Twp. [S3103] 1880 Washinton Co, PA. Census, Cecil Twp. Nancy Jordan was born on 22 June 1811 at South Fayette Twp, Allegheny Co, PA.. She married Benjamin Hickman, son of Peter Hickman and Abigail Fawcett, on 8 March 1832. She died on 7 August 1890 at age 79. Joseph Hickman was born on 3 October 1797 at Fayette Twp, Allegheny Co, PA.. He was the son of Peter Hickman and Abigail Fawcett. He died on 3 December 1883 at age 86. [S2119] 1850 Allegheny Co, PA. Census, South Fayette Twp. [S2128] 1840 Allegheny Co, PA. Census, Fayette Twp. [S2129] 1830 Allegheny Co, PA. Census, Fayette Twp. [S2133] Washington Co, PA. Tax List ,1819/20 Cecil Twp. [S2166] 1820 Washington Co, PA. Census, Robinson Twp. Moses Hickman was born in 1807 at Fayette Twp, Allegheny Co, PA.. He was the son of Peter Hickman and Abigail Fawcett. He married Jane Espey. He died on 19 October 1833. [S2108] Beers, Biographical Record Washington Co, PA., 453. [S4649] Mary Morledge Brownlee, History of Peter Hickman, p. 26. Abigail Hickman was born on 29 June 1816 at Allegheny Co, PA.. She was the daughter of Peter Hickman and Abigail Fawcett. She died on 28 November 1877 at age 61. [S4649] Mary Morledge Brownlee, History of Peter Hickman, p. 37. John Hickman was born on 2 March 1799 at Fayette Twp, Allegheny Co, PA.. He was the son of Peter Hickman and Abigail Fawcett. He married Sarah Park on 22 September 1836. He died on 16 February 1887 at age 87. [S2133] Washington Co, PA. Tax List ,1819 to 1824 Robinson Twp.